1 of 4 Heat oven to 350 degrees . Combine confectioners sugar, almond flour, cocoa powder and salt in a food processor. Pulse until combined and the mixture reaches a fine texture, about 30 seconds. 2 of 4 Add egg whites to the bowl of a stand mixer fitted with a whisk attachment. Beat on medium-high speed until foamy, about 30 seconds. Add cream of tartar and beat until soft peaks form, about 1 minute. Slowly add granulated sugar and beat until stiff peaks form and the mixture is shiny, 2 to 3 more minutes. 3 of 4 Fold 1/3 of the almond flour mixture into the egg whites, being careful not to deflate them. Repeat two more times, then transfer to a pastry bag or resealable plastic bag and snip off corner. Pipe 1-inch circles of batter about 1 inch apart onto two baking sheets lined with parchment paper. Smooth out tops of piped batter. 4 of 4 Bake at 350 degrees for 15 to 18 minutes. Cool completely on baking sheet. 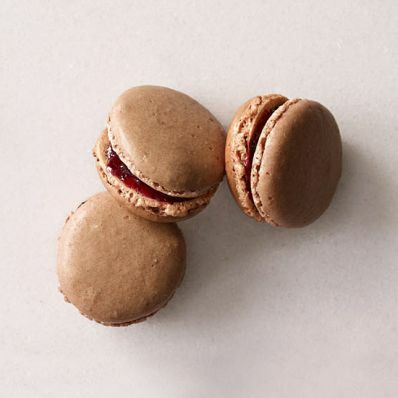 When cool, spoon a scant teaspoon of the jam in the center of the flat side of a cookie; gently press another cookie on top to form the macaron. Repeat with remaining cookies and jam.